#PLAIDURDAY celebrates the eternal truth of Tartan. Today I share yet another taste of the Tartan. The idea was a little Hop-a-long Cowboy Meets Highlander; the result seems to be Tyrolean Tourist. #SHOPSECONDHANDFIRST: This Tyrolean Tourist is 100% Thrifted. No matter,while out and about, I stuck out like a sore (bright red and tarty) thumb, and enjoyed a couple of compliments from passerbys. The hat seemed to catch the eye of stylish ladies, but the best comment was from the sweet Tibetan man who runs a tiny candle/incense/prayer flag shop down the street. He informed me that I was dressed to "look wonderful" and insisted I take home a box of incense that matched my outfit. I adored his sweet energy, and was glad to brighten his day,as he surely brightened up mine! Passion for Plaid: L'Affaire Cashmere offers a subtle range of wraps to rally warmth and romance. A shout-out to sponsor, L'Affaire Cashmere offering up a wonderful range of scarf options like this Two Sided Flip/Check Cashmere Stole. I totally noticed a little Gloria in the fish tank:) Love it! Great outfit! I love this post for many reasons. I don't know where to start enumerating but I'll give it a try. The hat, oh the hat. RED RED RED! tartan and stripes and ooooh the boots! and then the sweetness of that man's reaction to your clothes... Melted my heart! You can't go wrong with plaid!!! I LOVE this outfit--quirky, cool and so Bella!! 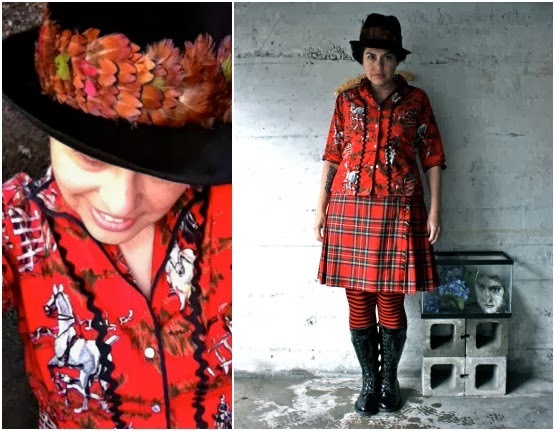 The hat is gorgeous, and I'm starting to be swayed by all the plaid I'm seeing everywhere! I think I'll go on a plaid shopping expedition this weekend. For some reason the first thing I thought of was outer-space. I'm not quite sure why but I love it either way! What captured me was the spicy, combination of different patterns and fittings in the same shade. It is so Bella! Lovely kilt ya got there lassie! THat looks like the MacDonald tartan, but I would have to check with The Scotsman on that one. I am in total adoration of this combo, the cowboy shirt and plaid and the hat. You are a fashion icon, Bella. You have amazing style. I love everything about this. I may have to steal this look! Wowzers, rad outfit Bella! 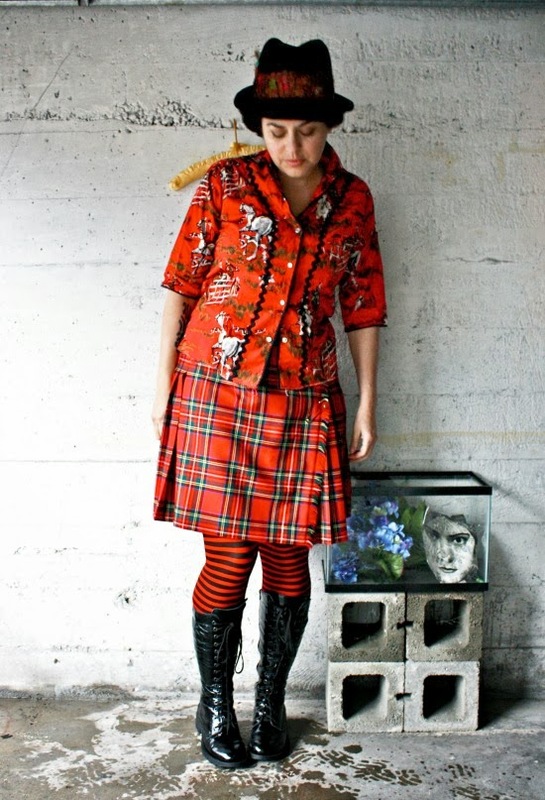 You look amazing in the red tartan, worn with real originality, flair and attitude. I like it very much from the waist down. Great tights, boots and skirt. Cool combination. But I would go more "quiet" at the top as I am not a great lover of too many pattern mixing. Lovin the hat, from your Etsy store? The Tibetan shopkeeper was right, you are dressed to "look wonderful" - what a lovely compliment! Great pattern mixing. Who would have thought that striped tights would look so awesome with a plaid skirt? I thought of you while wearing plaid this week! Rock on! Thanks for sharing with Visible Monday, B! Love the mixing Bella! I admire your original blend and cool hat. You look great! Divine hat, but the same could be said about this entire ensemble. You are brimming with creativity, Bella. The first photo won my heart! you really brighten up my day!! !, such a fabulous mix, love every piece and love how they work together, tartan, stripes, red print, pretty hat and cool booties! !, that booties really have stolen my heart away!! so glad to see you rocking the world!! I really like this blouse a lot Bella...and of course, the Bella-touch!! Have a wonderful Monday! You look fantastic! Nice hat. aaaah bella i love it! red, stripes and tartan, seriously i don´t think it could be any more fabulous! you rock! 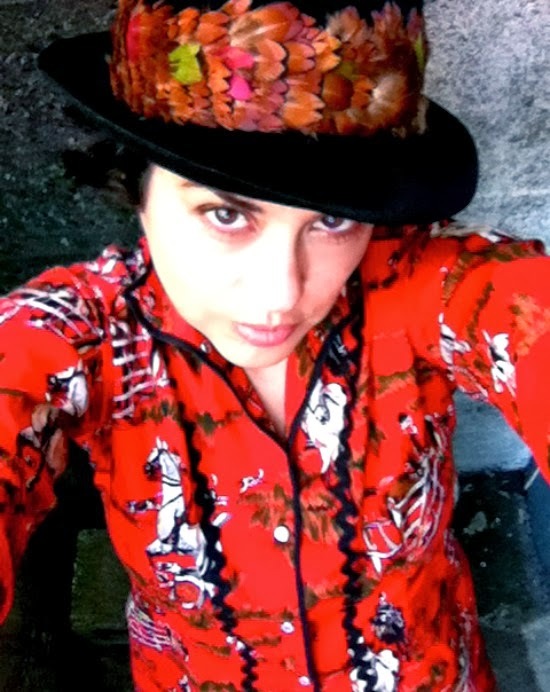 The futt bugly cowboy shirt with rickrack is a real winner. I'm also seeing lost Tyrolean Scotswoman at Machu Picchu. I love this outfit! And the freaky face in the aquarium is very cool. Yes, you are dressed to look wonderful. Your killing me with all this tartan ropa. I so wantyour shiny botas. your background is fantastic. face in the aquarium is so koo moo. Love it all, of course, but am particularly taken with the Hoppy shirt. My hero, from long ago. You're my Hero these days! Great all the time, without exception. You just keep looking better and better, young lady! I love your tartan skirt and the mix of patterns you added! Wonderful! the hat is gorgeous :)I really like this outfit.